Optimum Nutrition 100% Soy Protein is a great tasting option in soy protein powders that is economical and formulated to body builders, nutrition enthusiasts, and vegetarians alike. Just one scoop of this low cholesterol protein provides 25 grams of protein and meets the FDA’s heart healthy claim for soy in just one serving. 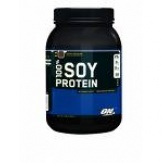 Soy protein provides options for vegetarians as well as those with specific food allergies or lactose intolerance. With each serving of Optimum Nutrition soy protein, health conscious people can enjoy a low fat, sugar-free formula perfected for anyone on a low carb or fat restricted diet. Soy protein powders are a convenient ingredient that can be added to pancake batters, hot cereals like oatmeal or cream of wheat, and homemade muffins or breads. Ingredients include soy protein isolate, cocoa that is processed with Alkali, natural and artificial flavors, lecithin, salt, and acesulfame potassium. One serving contains 120 calories, 2 grams of carbs, and 1.5 grams of fat. For the best results, it is recommended that you consume the daily protein allotment over 5-6 small meals spread out evenly throughout the day. Metabolism will be promoted. To encourage your body’s nitrogen balance, consume 1 gram of protein per pound of body weight per day from a mixture of high protein foods and supplements.